Often as our pets age we start to notice the development of lumps and bumps in various places. Sometimes these can be very small and freely moveable, growing slowly over time, or large ulcerations that create a significant amount of irritation and discomfort. 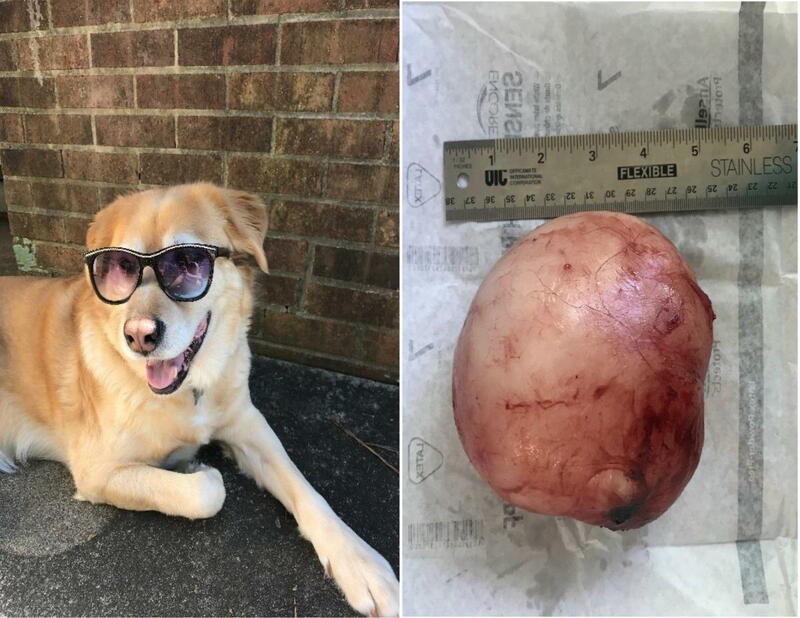 Regardless of the characteristic, it is always important to have these growths evaluated by your veterinarian as they can be cancerous in nature and be the first signs of a larger issue at hand. Thankfully, there are other types of growths that are benign in nature. These often are cystic or fatty in nature. A fine needle aspirate or biopsy is often the mode of diagnosis and can determine the severity or aggressive treatment needed. Recently, a patient presented for a very large firm growth on his left hip which had been slowly going over a period of time. At this point it was diagnosed to be a lipoma which is a benign fatty tumor but had grown so much that it was causing a significant amount of out-pouching from his hip and decreasing his mobility. It was decided that surgical removal was needed at this time. Surgery went smoothly and thankfully the lipoma was removed in full without breaking down its capsule. After surgery the lipoma was weighed at 1.2lbs. Often times, especially with such a large mass removal, a post-op surgical drain is placed to decrease the risk of seroma (fluid) build up in place of the mass. This is the body’s natural way of filling a void created by removing the mass. Unfortunately, seroma formation can significantly decrease the healing process and be uncomfortable to the patient. A surgical drain generally remains present for 3-5 days post-surgery until removal. This gives the patient the ability to release fluid and promote a quicker healing process. Though most lipomas do not obtain this size, it is important to continue to monitor all growths you may observe on your pet. Generally, surgical removal of lipomas is curative, though future lipomas can develop in different areas of the body. There are some breed predilections toward lipoma growths, most notably: Labrador Retrievers. Additionally, excessive fatty diets can predispose a pet to developing lipoma growths. Some growths require a more aggressive removal and diagnostic work up so it is important to have a conversation with your vet to discuss options and recommendations early on. If you observe any growths on your pet, do not hesitate to contact The Animal Hospital at Lake Brandt. Any of the veterinarians would be happy to evaluate and recommend what may be needed for your pet.